There has, however, almost from the beginning, been a cloud over this study. And very recently, a second cloud appeared. But first the study itself. 1.b6+ A blockade of the Queen's side pawns by Bc7+ must be prevented. 1...Ka8 2.Re1! And while it is still possible, even if it costs a Rook, the bottom rank must be closed against checks from a Queen that will appear on h1. 2...Nxe1 3.g7 h1Q (3...Nc4+ 4.Kb5 h1Q 5.g8Q+ Bb8 6.a7 Na3+ 7.Kc6 Qh2 8.axb8Q+ Qxb8 9.b7+ Ka7 10.Qg1+ Ka6 11.Qb6 mate) 4.g8Q+ Bb8 5.a7 Nc6+ 6.dxc6 Qxh5+ Now how to stop the checks that Black has anyway? After 7.Ka6 Qe2+ or 7.Kb4 Qh4+ they will go on. The move White plays now is the heart of the study, and of a recent book about similar moves. 9.c7! With only two pawns against an overwhelming majority, a silent move.The double threat c8Q+ and b7 mate forces Black to give the Queen. 9...Qa5+ 10.Kxa5 Kb7 11.bxa7 and White wins. We could wish that were all. But in many books, including Charushin's, and even Mitrofanov's own 'Deceptive Simplicity', the study is given with the Rook sacrifice (2.Re1 Nxe1) amputated (see diagram); that is, without a white Rook, and with the Nf3 on e1 already. The sad reason is that in 1970, soon after its triumphant appearance, the Soviet master Alexander Kuindzhi found a nasty refutation of the masterpiece. After 1.b6+ Ka8 2.Re1, instead of taking the Rook, he let Black continue with 2...Nc4+ There follows: 3.Kb5 Nxb6 4.Kxb6 (or 4.g7 Ka7 5.g8Q Nd4+ 6.Ka5 Nc4+ 7.Ka4 Nb6+ with a miraculous perpetual) 4...Nxe1 5.g7 h1Q 6.g8Q+ Bb8 7.Qg7 (see diagram) and all seems well (7...Qxd5 8.Qb7+ Qxb7+ 9.axb7 with a nice single-pawn mate) but Black has: 7...Qg1+! 8.Qxg1 Ba7+ and it is a draw. But apart from this amputated version, you will also sometimes see an amended one with the Rook on e1, but with the Nf3 on g2, which undoes the perpetual. This is so much better than that amputated version, without the Rook sacrifice, and the passive Ne1, that one wonders what is wrong with it. Neither Harold van der Heijden, the Dutch study-guru, nor I have been able to discover any fault in the Ng2-version, either on the board or in literature. It's a mystery that even Mitrofanov himself preferred the version without the Rook-sacrifice. Then, in September 1999, when I wrote about Charushin's and Mitrofanov's books in my chess column in the Dutch AD-Magazine, shivers ran down my spine when a former Dutch champion, Rini Kuijf, mailed me to say that after 1.b6+ Ka8 2.Re1 Nc4+ 3.Kb5 Nxb6 4.g7 Ka7 (see diagram) in Kuindzhi's refutation, White, instead of 5.g8Q, of course plays 5.Kc6! and wins after all. Mitrofanov rehabilitated! I could almost see the headlines: REFUTATION OF FAMOUS Qg5-STUDY REFUTED! Kuijf's main variation was: 5...Bb4 6.g8Q Nd4+ 7.Kc7 Nb5+ 8.Kd8 Bxe1 9.Qg7+ Kxa6 10.Qa1+ Ba5 11.Qh1 (see diagram) and White might be able to negotiate his h-pawn to Queen. And if he isn't, he wins a piece for it, reaching an endgame of Q vs. B+N or Q vs. 2B which is, according to the latest database-insights, winning. If only Mitrofanov could have known—but he had died in 1992. In any case, all those sadly truncated publications of the great work, together with the Ng2-ones, could be thrown away: the Qg5-study was restored to its initial splendor. But the genius hadn't run out of his bad luck yet. 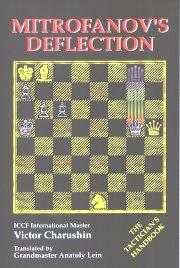 When I mailed this sensational discovery to Harold van der Heijden, he answered almost immediately that Kuijf's refutation of Kuindzhi's refutation was an interesting try, but that he had found an improbable move which refuted it. After Mitrofanov's 1.b6+ Ka8 2.Re1, Kuindzhi's 2...Nc4+ 3.Kb5 Nxb6 4.g7 Ka7 and Kuijf's 5.Kc6, (see diagram) Van der Heijden plays the incredible 5...Be7!! It's a move nobody would ever find in a game; worthy of a study in itself. Instead of capturing a Rook, Black puts a Bishop en prise, with check, on an unguarded square. The point is that by capturing it, the Rook would be lured away from where it defends against Black's promotion, and that Black himself now threatens Nd4+ and Nb5+ with a new version of Kuindzhi's perpetual. So: White has to play 6.Rxe7+ (Rb1 or Rd1 are countered by Nd4+) Kxa6 and now White has three tries, each of which misses the win by a hair. a) 7.Ra7+ Kxa7 8.g8Q On h1Q White would now mate with 9.Qh7+ Ka6 10.Qd3+ Ka7 11.Qa3+ Kb8 12.Qd6+, but with the Zwischenschach 8...Nd4+ Black spoils this. b) 7.Re1 This nice switchback sacrifice almost wins, too: 7...Nxe1 8.g8Q h1Q 9.Qf7 (or Qd8) Qxd5+ 10.Qxd5 Nxd5 11.Kxd5 Nf3 12.h6 Ng5 with a theoretical draw. In a game, White would have some practical chances here. But 'against best play', it must be a draw, and Mitrofanov's Qg5-study remains refuted. PS 8 January 2008: An even straighter way to the draw in the above variation c) is, as one JMRW writes, 10...Qh1+! 11.Ke5 (11.Kf5 Qxh5+ 12.Qg5 Qxg5+ 13.Kxg5 Nxd5 =) 11...Qh2+! (Qxh5+ 12.Kd6) and now White has to choose from three bad things: repetition; the loss of both of his pawns as after 11.Kf5; or the loss of his Rook with check, e.g. 12.Kf6 Qh4+ 13.Kg7 Qxe7+ 14.Kh6 Qf6+ 15.Kh7 Qe7+ 16.Qg7 Nxd5 17.Qxe7 Nxe7, all resulting in a draw. The other cloud was discovered recently by, again, Harold van der Heijden, when he unearthed the following old study. Before we turn to the question of Mitrofanov's originality: everything that is light, elegant, enjoyable in his study, is clumsy and cumbersome here. Farago's study is also grossly incorrect. To begin with, both Rini Kuijf and another reader, Jef Kaan, told me their computers had told them that 1.Ka6 is an extra solution; White mates in 13. Further, in the main variation, 3...Qb5+ or Qa5+ postpones the mate for some 10 moves. Not to speak of a tree of at least 200 moves in over 20 variations that is needed (mistakenly, too) to prove that only 1.g7 works. The two studies cannot be compared. But the fact is there: Farago found Qg5 first. What to make of that? Herbstmann, with his novelty of the idea, the jury with its it doesn't look like any other, were mistaken. If they had known they might, unless Mitrofanov had humbly added: "After Farago", not have awarded the first prize to his study. My guess is that Mitrofanov simply didn't know Farago's study. It has, until now, apart from its original publication in Revista Romana de Sah, probably only appeared in Farago's own collection of his studies, "Idei noi in Sahul Artistic" from 1956. Farago was a well-known composer in those years, but the book was in Rumanian. I don't think Mitrofanov would have seen it. And if he did, he would have turned the page as soon as he saw that ugly diagram. This is a case of 'anticipation'; somebody has an idea that somebody else has had before. The term is not meant to be a eufemism for plagiarism; such things happen. Mitrofanov's many brilliant studies prove he was more than capable of inventing Qg5 himself. I would even go so far as to say that if Mitrofanov did see Farago's Qg5 before he composed his Rustaveli-study, he was still justified in using it as his own, the way a great artist is justified in using an idea a lesser one has bungled. But I don't think it happened that way, and in any case: Mitrofanov deserves our full admiration for Qg5. LEOPOLD MITROFANOV composed a few hundred beautiful endgame studies, forty of which won first prizes. Many have the same kind of romantic, witty harmony that is characteristic of the Qg5-study. He was a chemical engineer by profession. Genna Sosonko remembers him from the Leningrad Chessclub of the sixties; a little scrag of a man, hardly five feet tall—his growth had been stunted by severe malnutrition during the WWII siege of Leningrad. He died in 1992 at the age of 60. With special thanks to Alexander Kuindzhi and Harold van der Heijden.